Successfully Added KGB High Definition Cam to your Shopping Cart. A high quality camera, video recorder and flash drive all in 1 at an unbeatable price! Are your old-fashioned pens easily recognizable? What if your new James Bond product looked like a marker? Who could imagine behind its simple outlook there is a high definition camera? It is so easy to handle that time has come for anyone to lead the new generation of secret agent! Not only images are recordable but also voices! Whatever you want to know will be accessible. The sound is very clear you won't miss a single word and each person speaking is identifiable. It's also a good help if you can't remain focused during your class or meetings for too long! Otherwise just buy it for fun to play with and surprise your friends. It will fulfill all your hidden desires. All the signs mentioning "No photo" won’t concern you anymore! Have you ever dreamt of a small, cheap, practical and high performing camera allowing you to take films and photos in any circumstances? Or you simply want to be sure it won't end up at the bottom of a beer cup after a party washed down with plenty of alcohol? This item is exactly what you are searching for. Thanks to its size, weight and shape it can be easily inserted in any pocket after use and fits in every bag to be stored safely. In other terms it is always hand-reachable so it will follow you everywhere. But the most outstanding part comes when you transfer files to your TV (via a HDMI cable) or computer to watch them: videos in high definition (1280*720P) and photos up to 8 Mega pixels! Each detail will appear so clearly that you will agreeably wonder how it is possible. You will be amazed at the stunning picture quality when viewed on your big-screen HDTV. From now on you will catch any important moment of your life you couldn't before! The well protected slot can accept a mini SD card up to 32GB! It means you can bring with you all the games, movies, songs and pictures you wish beside your top secret documents. It makes this product essential every day. Furthermore a SD card of 2GB is provided for free so that you will be able to start enjoying your new purchase as soon as you receive it. This advanced digital pen has this aspect that makes it funny, useful and exciting at the same time so your collection of electronics won't be complete without it! And this is brought to you by the online leader in China wholesale gadgets - Chinavasion. É semplicemente un ottimo prodotto, peccato nn sia piú in catalogo. "Maximum video recording: 50 minutes" - can really write 59-60 minutes. The device creates a file in the size ~ 1115 MB for each 30 minutes of record - 2GB memories of it not enough for 60 minutes. I have put Micro-SD on 32GB. It works. Shipping to Russia by means of Hongkong Post - it is not expensive and reliable. ~15 days after sending. 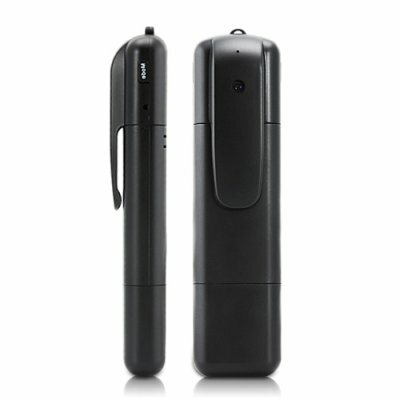 I've tried various spy cams, pen cams, mini pvrs, etc and this one is by far the best of its type or price range. Its MUCH better than the traditional round Pen cam; the ones that can write. The buttons and indicator lights on this one are much better and easier to use. It is just as obscure as the round Pen style when in the pocket or set next to something on a shelf, etc. The build quality and reliability of this unit is much better. The picture quality is exceptional compared to the other small mini DV cams like the MD80. The video in low light gets grainy but is still usable and better than other cams. In good light the quality of the video is clear and sharp and the color is better than other mini cams under the same lighting. The individual frames of the video are sharp and can be used as a still picture. I recommend this item highly.